My recently discovered ‘running with a famous guy’ photo. I’m drafting Sir John Walker. Living in an age of the smart phone and social media accounts, two words seem to get a lot of air time than they ever did when I was a kid – in fact one of the words, the selfie wasn’t even invented. The second word, narcissistic was – although I never heard it used. Nowadays the word is considered a derivative of living in a world where social media allows people to share themselves globally to build a sense of self importance and standing that doesn’t always correlate with their standing in reality. I haven’t been on social media long but one of the things I immediately noticed when I was, was people mostly play real nice, no doubt to retain their followers or ‘friends’. When you have as few followers or ‘friends’ as I do, if people stop following you it’s really apparent. Having 20 followers and losing six of them does hit you between the eyes. On the other hand if you have 15,670 followers and drop six you still have 15,664, so in all likelihood you’re only focusing on the 15.6 – but I wouldn’t know as I don’t know anyone with thousands of followers to test that theory on, although I suspect that when you have that many followers you’ve also bought yourself latitude to be a lot truer to yourself and able to speak your mind with confidence knowing that if you do manage to piss people off, and shed a few hundred followers, you’re still going to retain a lot of them after the dust settles. Recently I watched Black Mirror – which by the way I recommend watching. The show is a British anthology speculative fiction series with a focus on unanticipated consequences of new technologies on society. The first episode of the third series called Nosedive examines a future society in which everything you do is rated out of five stars. Depending on your popularity score, life opportunities are either afforded or denied you. Everyone’s behaviour in this society is driven by a need to maintain or improve your popularity rating to the point that if you want to buy a house in a particular suburb or street you need a 4.5 to gain entry, or if you want to trade up to a certain model of car, you need a 4.3, with all aspects of your life determined by your popularity rating. Naturally those who didn’t care a toss about their popularity with a rating of one point something were portrayed as being the most happily content, due to having opted out. No pressure on them to stay popular. Nosedive tells you pretty much what the episode is about. A falling popularity rating and how one’s life gets worse due to that. It was a great original story that I also found quite troubling, given that around us today, there is enough evidence of the same conforming and suppressed behaviour as to who we really are and what we truly think. Rebels without causes must be rolling in their graves aghast at such a world. The other thing social media lets you do like never before is express yourself by capturing your every move all by yourself – via the selfie. For me, I just can’t bring myself to do a selfie with some famous person. Never have, not likely to ever. That said, I was reminded of the selfie earlier in the week when I came across a photo of me running a track race (the photo above). That photo surprised me because it showed me tucked in behind the great Sir John Walker – master miler, first guy to go under 3:50 for a mile and to post 100 sub four minute miles among loads of other achievements – in a race I’d completely forgotten I ever competed in. 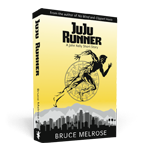 I’ve been asked several times previously if I ever raced anyone famous, to which I replied, ‘yes, I have’ – on occasion, but I was probably thinking more of Kenyan steeplechasers. I do recall someone specifically asking me once if I’d ever run against John Walker – as he was a household name everyone knew, and being very impressed when I nodded and said I had. Mark’s ‘running with a famous guy’ photo. Looking through social media, everyone’s got one. 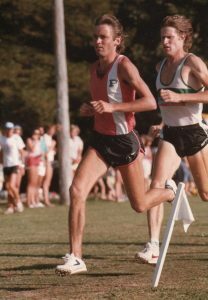 Until last week, as I remembered it, I’d raced Walker twice, once in a road race when I was a first year senior athlete at Avalon, the second time over a mile at a time when he was bashing out sub fours on his way to running 100 of them. That mile race was at the Hutt Recreation Ground under lights on a grass track. I think I might have run 4:06 or something like that, which for me was a handy time as I was better suited to longer distances. In the intervening years I’d totally forgotten about the third time I did laps with Walker, so the photo given to me recently, returned a long forgotten memory. 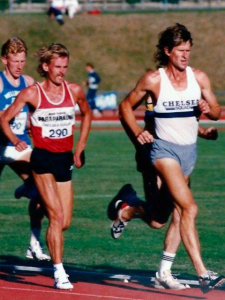 It also reminded me of an old running mate of mine, Mark Handley – a four-minute miler who also has a wonderful photo of himself striding out with Walker. Knowing that prompted me to think that if other competitors I raced against also have their own photo of themselves racing with Walker or someone else famous back in my era, these are in effect their selfies of the 80’s, a pre-internet period where to be seen with the famous, you actually had to do something other than go over and stand with the famous person holding out your smart phone and social media account. In that, getting my 80’s ‘selfie’ with ‘the famous guy’ was pretty darn hard to do and always required an accomplice to take the photo. When I first saw my photo earlier this week, it left me with a real sense of deep satisfaction. I’m so glad I finally got to see my own ‘running with a famous guy’ photo even if twenty-eight years after it was taken. That’s got to be worth a 4.9 for whoever took it.